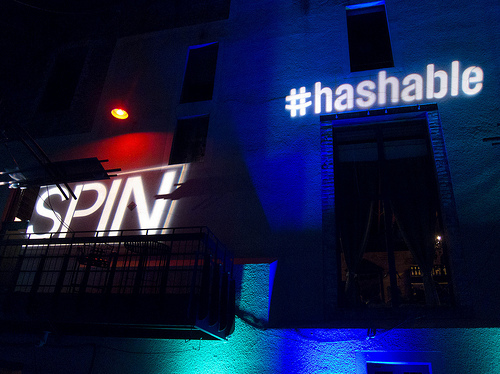 Hashable is the ultimate networking app. Exchange business cards, make easy intros and ‘check-in’ with people to track meetings and calls. Since it seemed like all 17,000 attendees as SXSW were armed with smart phones, laptops and ipads, it was the perfect environment to test out Hashable. Instead of swapping business cards, all you had to do was tweet the other person’s Twitter handle along with #justmet and @hashable and a tweet with a link to your contact info shows up instantl on Twitter (there’s a way to do this privately, too). 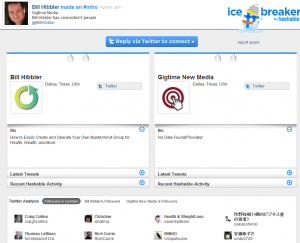 When either party then clicks on the link within the intro tweet, they’re taken to an “Icebreaker” page like the one below where they can find out more about the other party and, if they choose send out a request for a meeting or call. (Click to see the full-sized image). 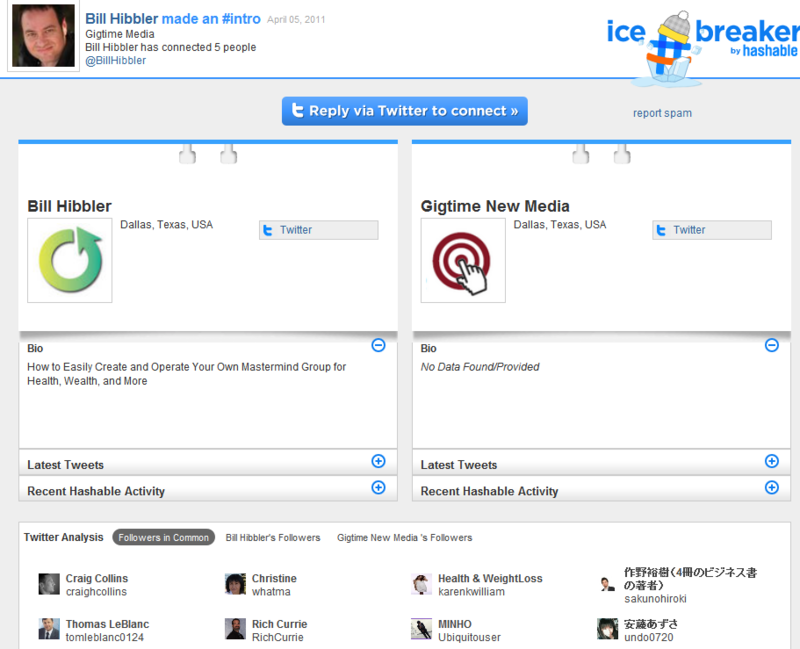 Beyond introductions, you can use Hashable to mention and track meetings, meals, thank-you’s or any other interaction. Hashable has a suggested list of hashtags but you’re free to make one up, too. Hashable is still in public beta testing and it’s free to use. Whether or not it catches on, we’ll have to wait and see but it’s an interesting way to stay connected with people and track your relationships. There’s a point-based system that rewards usage with standings on a leaderboard similar to what apps like Foursquare use to encourage participation. Will Hashable replace the business card? Probably not any time soon but does introduce some interesting possibilities. Do you think it will catch on? Do any ideas come to mind on how you might use Hashable? Post a comment below and let me know what you think. Great article Bill, well written! 1) I ran into someone in passing and I wanted to make sure I got his info. It was in a non-business setting, so he didn’t have his cards (and I don’t carry them anymore), so I “hashed” him using the #justmet feature using his email address. Because Hashable logs all that info for me, 3 days later I needed to email him some stuff and didn’t have his phone number or twitter handle or ANYTHING for that matter, so I went back through my history and found his email that I had entered and emailed him with 2 taps, right from within the app! That was super powerful to me. 2) When someone in my inner circle checks-in with someone else, my iPhone sends me a push notification about that interaction. Recently a close friend posted they were having coffee with another close friend of mine, but a brand new relationship to them. So, right from within the app, I commented via tweet on the interaction they were having in real-time and notified my close friend that hashed the initial check-in that he in fact was meeting with a person that was already a friend of mine…which made the rest of THEIR meeting that much more powerful…all in real time. Again, super powerful to me. There are some other super powerful nuances to this app, all in addition to the checking-in, introductions, and #justmet’s, but this is long enough. I think as more and more people find these powerful tools that the app gives them, it will catch on…but I don’t predict mass adoption until next year in early 2012. Thanks, Eric. I appreciate that! You’re spot on in #1. I’ve worked with so many Internet marketers that don’t even have cards because they do everything online and rarely meet their prospects or customers in person. And the trackability has so many possibilities. And great example of how Hashable can enhance relationships in your second example. Been too long since I came by! Thanks for stopping by, Seth! Looking forward to seeing our interview come out. That was a marathon!